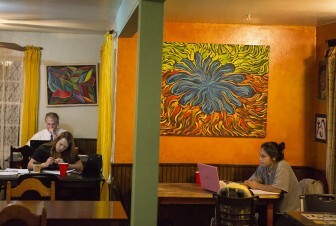 Merriam-Webster defines “satori” as “sudden enlightenment and a state of consciousness attained by intuitive illumination representing the spiritual goal of Zen Buddhism.” For well over a decade, Satori Coffee House on Old Shell Road next to the Brick Pit has provided enlightenment in multiple ways. I used to visit when it was a record store. I’ve gigged there on more than a few occasions. It’s easy to get “enlightened” on the coffees and teas that fuel the students and faculty of the University of South Alabama. 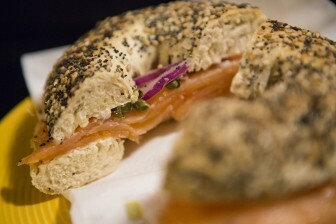 But nowadays if you want to get the best bang for your spiritual buck from Satori, you must treat yourself to the food. With a menu that starts at breakfast with burritos, croissants and bagels and morphs into salads that can include black beans and avocado, and finishes with wraps, panini and sandwiches, it is no wonder that even former employees of the university go out of their way to eat at this establishment. With that in mind, I donned my finest Batman tee and called for my trusty sidekick Rob to pick me up in the Napmobile to protect and serve the hungry college crowd with our usual brand of swift vigilantism. 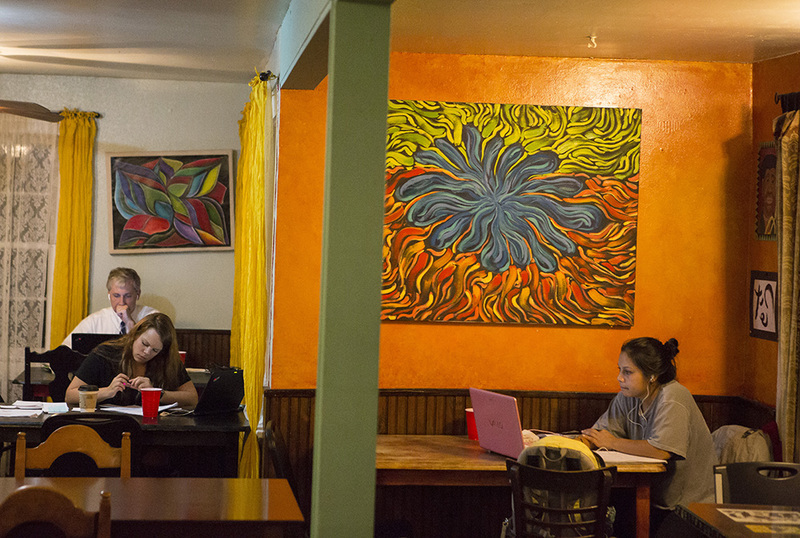 (Photo/ Daniel Anderson/Lagniappe) Satori Coffee House offers more than a fresh cup of Joe. Its menu of traditional cafe food is affordable and satisfying. We headed over for lunch, found a secret place to park in the lot behind the building and entered through the back door. Everything was secure and we made our way to the counter as young adults worked feverishly on their laptops, no doubt enjoying the free WiFi along with their beverages and sandwiches of choice. Looking at the expansive menu you, see about 40 items, every single one priced under $10. If I recall correctly, the most expensive thing I saw were a couple of items marked at $6.25. Forgive me if I missed something. The problem with the menu is simply deciding what you want. The vegetarian options sound great. Those who practice pescatarianism can add salmon for $2. Episcopalians will be happy to know there are wine, beer and liquor options. If it sounds as if the selections are all over the place, then I am giving you the wrong impression. Their “bread and butter,” if you will, is really good wraps that hit on many notes. Chicken comes in many forms here as does turkey, but there are also a couple of ham and roast beef choices. Rob showed no signs of hesitation as he stepped up to the plate. He ordered his usual Chipotle Chicken wrap ($6.25). It was piping hot and perfect, so I can see why he never strays. Chipotle dressing tops off the chicken with rice, tomato, onion and lettuce for a smoky flavor. It is, by the way, a fairly large wrap. For this price range, they do not skimp on the quantity. I hastily perused the menu and without much thought blurted out the words “Thai chicken wrap” ($6.25). I also nabbed a bag of Funyuns ($1) and a side salad ($2). When asked what dressing I preferred I requested anything spicy. The gentleman informed me the Thai dressing was the spiciest they had, so it made sense to pair it with my sandwich. The dressing was really good, as were the Funyuns. It was the sandwich, however, that was worthy of an award. Cucumbers and carrots provided the sweetness while the tomatoes and peppers brought out the savory, spicy side of things. A little cabbage and lettuce were less pronounced but not underappreciated. For that $6 range, this is a steal. I can’t tell whose wrap I like better, mine or Rob’s. It isn’t enough to write about two sandwiches and get the idea of what a place is putting out, so I grabbed a muffuletta ($6.25) for the trip home. You should know I judge muffulettas pretty harshly, but I must go easy on this one. It really isn’t trying to be a true muff, so think of it as a nod to the sandwich king rather than an attempt at reinvention. Satori’s is a layer of ham, turkey and Muenster cheese with a dollop of olive “relish” on pressed French bread served hot. It doesn’t really qualify as a muff in my opinion, but it is still a very good turkey/ham sandwich with olives. I read the description and did not feel anything was misrepresented. You should try it. A shaky voice uttered, “No, I just like the comics.” Just checking, son. Justice prevails. All was safe when we left Satori, and yes, we suddenly felt a little closer to enlightenment.